The section that follows displays MLS listings of homes for sale in the Goodnight Ranch Austin neighborhood. Call or text Jim at 512.913.1557 for more information. Neighborhood Location: Goodnight Ranch is located in Southeast Austin. From IH-35 South, take exit 226 and turn east on Slaughter Ln. Goodnight Ranch is located on the left about 2.5 miles east of IH-35. 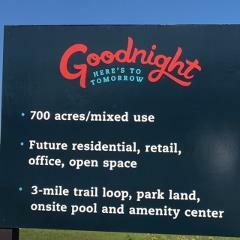 Scroll down to see more info on the Goodnight Ranch Austin. Click link to see featured Southeast Austin Neighborhoods with an interactive Google Map. The table that follows is designed to give you an overview of real estate market activity in Southeast Austin's Goodnight Ranch subdivision. Goodnight Ranch Austin real estate data from the Austin Board of Realtors, 1/1/2017 - 12/31/2018. Goodnight Ranch in Austin is a recently-started development in Southeast Austin. When completed it will have around 3,500 residences, including single-family homes, duplex-style homes, townhomes (future) and apartment homes (future). It will have a number of pocket parks, a 3-mile trail system, four community ponds and a community pool for the use of residents. In April 2018, there are 3 active home builders in the Goodnight Ranch community. These are Homes by AVI, Centerra Homes and M/I Homes. M/I Homes offers 7 plans with 1,800 to 2,788 sq. ft. of living space. Base prices range from $288k-$327k in April 2018. These are single-family residences with up to 4 bedrooms and 2.5 baths. Centerra Homes has 6 one-family models with 1,469 to 2,242 sq. ft. The smallest of these plans feature 2 bedrooms and 2 baths. Other plans have up to 4 beds and 2.5 baths. Base prices for these 1- and 2-story homes begin at $270k in April 2018. 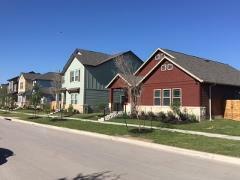 Homes by AVI is building single-family duplexes in the Goodnight Ranch community. These have varying exterior and interior styles, but all have 1,792 sq. ft., 2-stories, 3 bedrooms, 2.5 baths and base prices of $247,990. Shopping, Eating, etc. 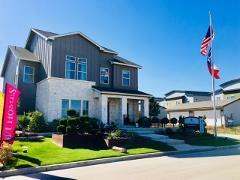 : Goodnight Ranch is located a couple of miles east of IH-35 and the very popular Southpark Meadows shopping development. Major stores at Southpark Meadows include Sam's Club, Target, WalMart, Beall's, Marshall's, and JC Penneys. Many other smaller businesses, a movie chain, and eateries (Jason's Deli, Subway, for example) are located in Southpark Meadows. The Cabela's outdoor store and other stores can be found to the south in Buda, Kyle and San Marcos. Many are located north of Southpark Meadows in Austin. mountain-biking, fishing, family outings like picnics, and more. Onion Creek runs through the McKinney Falls and Onion Creek Metro parks. Golfers can play at a number of courses in the Austin area (Jimmy Clay and Roy Kizer are the closest) and in Kyle (Plum Creek). Membership in the Goodnight Ranch Homeowner's Association (HOA) is required. The HOA fees of $40 per month are mandatory. The fee covers maintenance of neighborhood common areas. The students living in Goodnight Ranch attend schools of the Austin Independent School District. It is always wise to verify current schools with AISD since they can change from year to year.